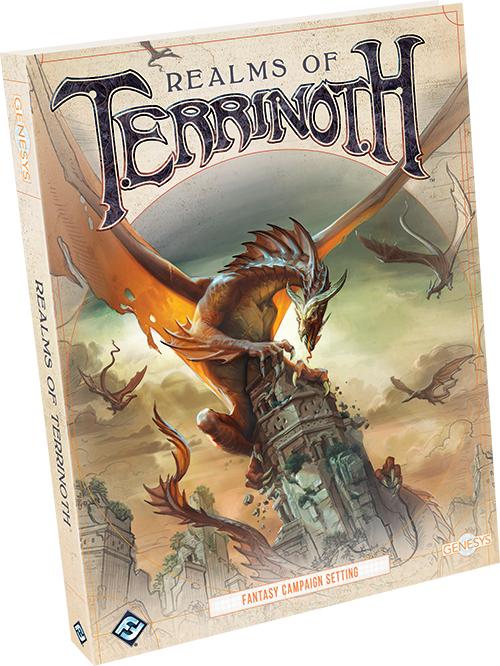 Order your own copy of Realms of Terrinoth at your local retailer or online through our website today! Mennara is a land defined by its source of magic. Shards of an ancient orb allow magic users to harness powerful energies—to conjure pyres of fire, to turn the very air into freezing ice, to inspire terror in those around them, and so much more. Now, you can bring these instruments to life! 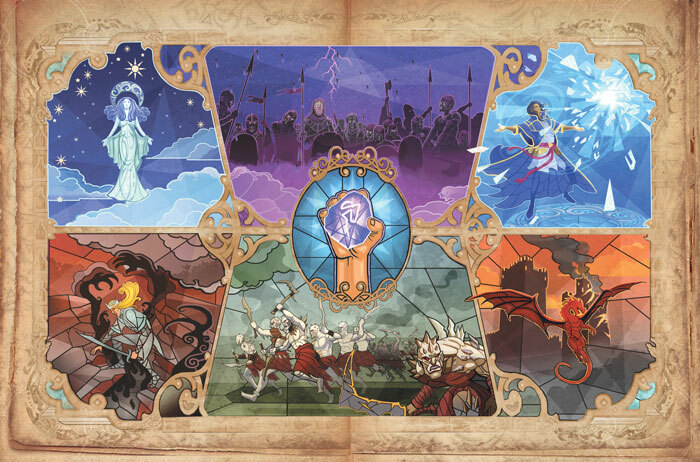 Join us today as designer Tim Huckelbery examines the history of these ancient runes, and how they are implemented in Realms of Terrinoth, the new sourcebook for the Genesys Roleplaying System. Read on to get a glimpse of the magical options available to you in the land of Mennara! 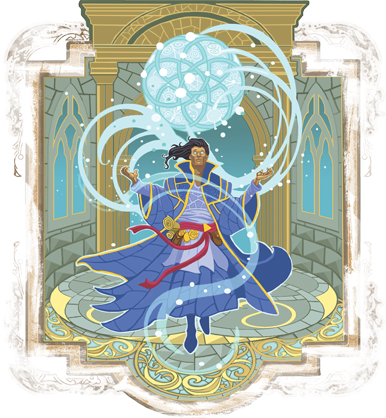 Tim Huckelbery: There are many theories as to why Timmorran Lokander, the greatest magic user Mennara has even known, set forth to create the most powerful magical artifact of his or any other age: the Orb of the Sky. Those who trusted him believed it would allow other mages to power their spells without needing to draw upon the Verto Magica, the great Turning that drives all motion and life. In the aftermath of the First Darkness, such an item would be invaluable in protecting Terrinoth from another horrific invasion. Others viewed it with suspicion and jealousy, and to keep it from falling into the hands of evil, Timmorran was forced to shatter the Orb. The resulting multitudes of crystalline fragments each contained more pure, solidified magic than had ever been seen before. Timmorran charged his apprentice with hiding them away for safekeeping… but such a secret could only be kept for so long. Generations passed, and a new line of rulers emerged in Terrinoth. Known as the Elder Kings, they openly used the so-called Stars of Timmorran to perform great feats. Their renown spread—as did the knowledge of the Stars. Most scholars believe it was this growing knowledge of the Stars’ existence that began the Third Darkness. The dragonlords emerged from their mountain lairs, destroying everything in their path as they sought out the Stars. Such was the power of the dragons that they were able to break the Stars into untold numbers of smaller fragments and could inscribe powerful runes on them with their adamantine talons. Each rune fixed that fragment with a specific magical power. An inscribed rune of fire, for example, fixed that fragment’s power to flame and heat. These “runebound” shards were less powerful than the original fragments of the Orb and limited to just a single magical ability, but they had the advantage that one didn’t need magical skill to call on their power. This allowed the Dragonlords’ lieutenants to wield them in battle, but when those lieutenants eventually fell, the runebound shards were scattered across Terrinoth to be recovered by heroes and villains alike. Runebound shards became a part of life in Terrinoth after the Third Darkness mysteriously came to an end. The scholars at the University of Greyhaven specialize in studying them, and they train runemasters skilled in their use. The mighty rune golems may also be awoken here, each embedded with a runebound shard to provide animation and power. Runebound shards are also used to craft magical weapons and armor, and many a Daqan Baron goes into battle armed with heirloom runic items. Though other magical sources and sorcerous practices still exist, the use of runebound shards has become the dominant source of magic and enchantment across much of Mennara. To reflect the way magic works in Realms of Terrinoth, we added quite a bit to the Magic rules as presented in the Genesys Core Rulebook. These new rules allow players to not only create characters firmly planted in the world of Mennara, but also call on magical powers in ways that better reflect the nature of magic in that world. Like everything in Realms of Terrinoth, though, they can be easily used in almost any other fantasy setting that players can envision! The first thing players will likely notice is a new career: Runemaster. This is a variant of the Mage career (itself a new career! ), and it grants a character the Runes skill (more on that in a bit), as well as a special type of runebound shard known as a lesser rune. Lesser runes are excellent items for new characters, as they can add an effect to any appropriate spell without increasing the spell’s casting difficulty. The new Runes skill lets characters gain full access to the power of the runebound shards as they increase their ranks in the skill. While almost anyone can use a runebound shard to unleash the item’s basic effect, only those with the Runes skill can unlock a shard’s full power. Training in the skill allows characters to fully comprehend the nature of the rune and know what each inscribed shape means. 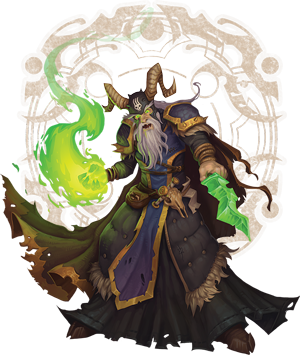 Most Runemasters have no inherent magical talent themselves, and it is only through research and study that they can activate a runebound shard to full effect. This skill also allows a character to learn more about the nature of runes they encounter on their adventures, and thus likely determine the shard’s nature before attempting to use it, which can otherwise be quite messy, hazardous, or embarrassing—or all three. Runebound shards can also be found in some mainstay magical weapons and armor, so Realms of Terrinoth allows players to use them as implements to customize items. Characters can thus wield swords with a shard of runic flame melded into the blade or wear stronger armor courtesy of the ironbound rune. Then there are the actual runebound shards, even the least of which can be the subject of legendary quests. As such, these are priceless items and cannot be merely bought with coin. 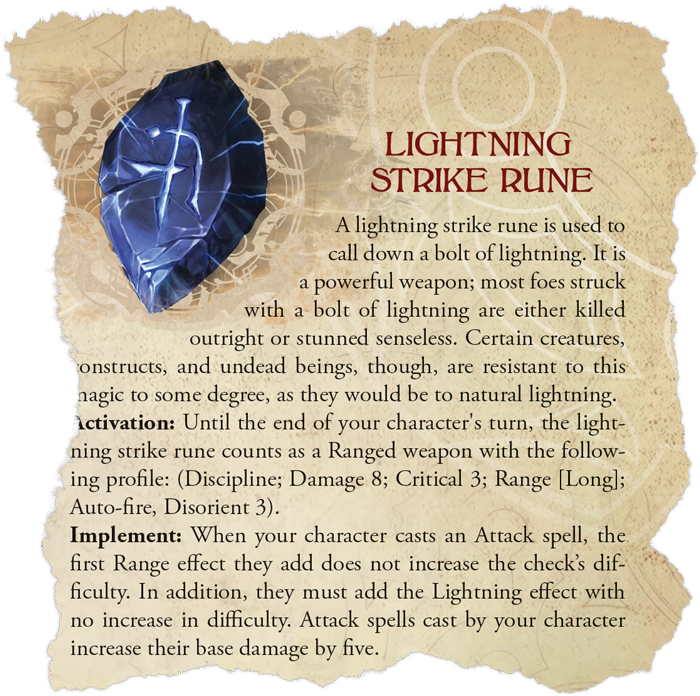 Only though blood and courage will characters uncover such prizes as a deadly Arcane Bolt Rune or Ice Storm Rune. Like many runebound shards, these can function as powerful weapons in even unskilled hands, but when a character with the Runes skill wields one, their magical potential can be unleashed. Those inexperienced with a runebound shard may use its Activation ability, while those more experienced can use the shard's powerful implement abilities. Other runebound shards, such as the aptly named Terror Rune, are less about raw magical force, offering other effects such as ignoring the effects of fear or forcing the targets of spells to make fear check. Others, such as the Stasis Rune, can immobilize foes, while the Wanderer’s Stone can heal allies and improve stamina. The runebound shards are only the beginning for heroes adventuring in the wondrous lands of Mennara, of course. Genesys is designed to be a toolbox for roleplaying games, so players and game masters are encouraged to create their own runebound shards, forge new runes to empower or modify weapons, and even create new skills to use rune magic in different ways. Entire campaigns could revolve around attempts to fashion new runebound shards, alter draconic runes to imbue new magical abilities in shards, or even find a legendary unbound shard—one of the original Stars of Timmorran! Unleash the power of the shards in Realms of Terrinoth (GNS03) available now for pre-order from your local retailer or our website!